What Are Fish Scale Functions? Fish scales have a variety of functions ranging from protection to aqua dynamics, however, not all fish have scales, according to VersAquatics. The Mailed Catfish, rather than scales, has bony plates to protect its body. The scales on the body of a fish overlap like shingles on a roof, according to VersAquatics. They create rings much like those in the trunk of a tree, which provide scientists with a way of determining the age of a fish. A fish's environment can be dangerous and full of predators, pests and sharp objects that can cause the fish injury. 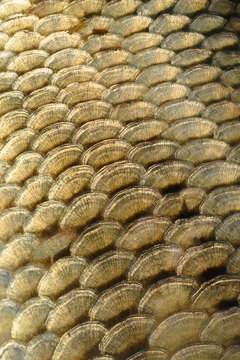 According to Microscopy UK, the scales of the fish provide a form of armor plating to protect it from injury. According to VersAquatics, there are two types of scales on fish. Both are round, but the first has a serrated edge and the second has a smooth edge. Microscopy UK says that scales assist the fish in swimming by reducing water friction and resistance. The scales of a fish are not the final layer of protection on the body of a fish; the scales are covered by a layer of slime called the epithelial layer. This adds an extra layer of protection to the scales and the body beneath.